The record label Harmonia Mundi had set the date and time for the interview on Friday, 3 December, at 6 PM. I was asked to arrive a few hours earlier to attend the rehearsals for that same evening’s concert. The program: Schumann’s (1810-1856) Dichterliebe Op 48 and Liederkreis Op 24, together with five Heine songs (from Sängerfahrt Op. 33) by Franz Paul Lachner (1803-1890). The artists: the British tenor Mark Padmore (b. 1961) and his musical partner, the South African pianist Kristian Bezuidenhout (b. 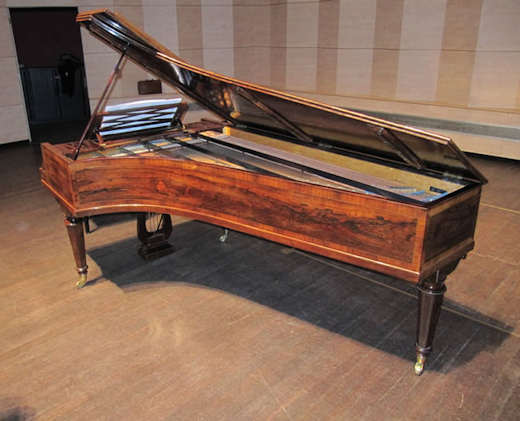 1979).The instrument: on stage one would hardly associate the 1837 French Erard piano with Robert Schumann, although Clara played on such an instrument when giving concerts at the Conservatoire and the Erard salon in Paris in 1839. 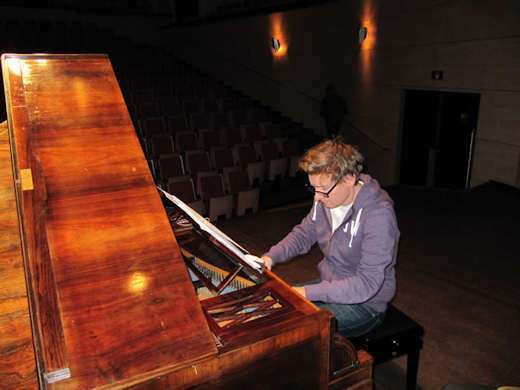 Andreas Staier recorded a number of piano solo works by Schumann on that same instrument for Harmonia Mundi. The venue: the ‘Jurriaanse’ chamber music hall, part of the grand Doelen concert complex in Rotterdam. The weather: dark and grey, with low temperatures and snow just around the corner. In the hall I spotted Edwin Beunk, the indefatigable Dutch collector and restorer of old pianos, who is so frequently on the road with 'his' instruments that he sometimes forgets where he is. It is nothing special for him to be in Amsterdam, Rotterdam and Enschede this week, and in a few days at the Salzburg Mozarteum, always of course with one of his precious instruments that need to be tuned for the next recital. The workshop in Enschede is always busy, having the facilities needed to do all the woodwork, to work on the strings, the keyboard mechanism and the pedals. Very old instruments are taken apart and are rebuilt with original materials. Missing parts are copied from similar instruments, using old materials and assembling techniques. Beunk and his staff take quite a bit of pride in having rented out restored instruments for concerts and recordings. Indeed, these are often booked years in advance, and have never failed to perform. His experience ranges from the Viennese 'Hammerklavier' of Mozart's time up to the instruments of the Brahms era, but also includes pianos built by companies such as Broadwood in England and Pleyel and Erard in France. For this occasion, Beunk himself brought the 1837 Erard in his van from his workshop in Enschede. When I arrived he had just finished tuning for the rehearsal. Later on, he would tune for the evening concert. And so it was. We decided to have a quick bite to eat in the concert hall's restaurant. The meal certainly suited the occasion: British fish and chips. Time to talk! Padmore once said that he used to be treacherous with his pianists. The list proves his point: in the past he was partnered by Graham Johnson, Julius Drake, Roger Vignoles, Imogen Cooper, Till Fellner, Paul Lewis and now Kristian Bezuidenhout. His previous partnership, with Lewis, came about by chance, after they had coincidentally met at Marseilles airport. 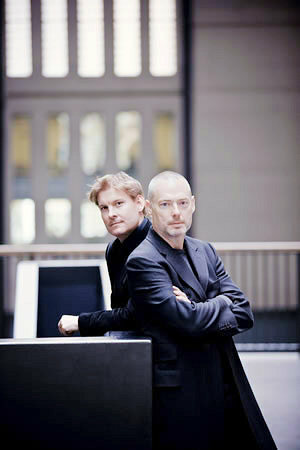 As with Bezuidenhout, who was invited by violinist and festival director Daniel Hope to accompany Padmore in Schubert’s Winterreise in Savannah, Georgia. Daniel, who had already collaborated with both of them individually, ‘engineered’ the duo recital. It so happened that this collaboration was an instant and great success, followed a couple of years later by a concert in Cologne. Then came this Schumann/Lachner project, which was recorded by Harmonia Mundi in London. Could it be of any significance that both Padmore and Bezuidenhout were once wind players, the former playing the clarinet and the latter the flute? Mark did not think so, but Kristian thought it plausible that the way in which a wind player ‘colours’ the music might also affect his piano playing. They are almost physically aware of tone colour by the connection between airstream and tone, which is quite different from the pianist only touching the keyboard. Admittedly, it is a theory, and certainly not more than that, but it could work that way. So it all comes down to perceptiveness and responsiveness? With a modern Steinway, any good accompanist must have a clear understanding of balancing with the singer, and especially in the piano’s lower middle register there is the immediate rivalry with the tenor. I would say that the rather delicate tone registers of those old instruments suit the voice very well. Thanks to this refinement, a tenor does need not surpass his natural limits to make himself heard. Kristian: “It’s fair to say that there is less negotiation needed. The piano’s textures are very refined; there are even clear evocations of other instruments. And there are those diversities of contrast in the various registers that can be musically exploited. In the past, and even not so long ago, there were pianists like Gerald Moore (“Am I too loud?”) who were almost exclusively devoted to accompanying singers. Today we have a fascinating variety of great piano soloists in the lied repertoire. But not everyone is enthusiastic about this development. For instance, there is the probably everlasting suggestion that soloists should not be engaged with the lieder repertoire, as they are supposedly too much occupied with their own solo career or too self-conscious in their musical interpretation. They are not ‘at the singer’s service’, but rather they feel the need to shine themselves. No prima donnas, please! Beethoven (as in his late sonatas) and Schubert did not particularly write with pianistic convenience in mind. In Schubert’s Winterreise, for instance, there are many plain lines and straightforward chord progressions which fail to inspire great playing. Schubert did not regard the piano part itself as a milestone, but rather – it seems to me - the cycle as a whole. We hear many glorious inventions, adventures and refinements alongside many undemanding passages. Perhaps Schubert was less connected to the keyboard as a musician and a composer? Sometimes, when an old piano is waiting on a still empty stage, I have noticed some premonition in the audience. As if they were thinking ‘good heavens, will we have that one-dimensional honky-tonky sound again tonight?’. I still remember the days when song cycles were hardly ever performed in their entirety. Instead, we were presented with snapshots, the choice being with the singer. Today we might say we’re spoiled, with all these full-length performances of song cycle s auch as Die Schöne Müllerin, Die Winterreise and Dichterliebe, and even of Schwanengesang (which originally was not a cycle at all: Schubert’s brother and his publisher subsequently made it so). We might say that Winterreise is a gloomy work, but that Schumann’s Dichterliebe is much less in that vein. Do you feel Schumann’s later mental darkness in this song cycle already? And for us as well. It might be added that to Schumann the poetry of Heine and Eichendorff opened up musical paths to all the romantic emotions from that period. There were these heartfelt images of wandering, nature, lost love, longing, regret and sorrow. Every contemporary musician should find his dictum to put the words and music in a present-day perspective as well. What about the connotation of musical depth in symphonies, concertos and chamber music? What about recording? It seems to be an art in itself. Why Lachner is in their repertoire? You’re also performing Liederkreis Op 24, Schumann’s song cycle which is also on texts by Heinrich Heine. There is another Liederkreis by Schumann, his Op 39, on texts by Joseph von Eichendorff. In 1847 in Vienna, the great poet told Clara Schumann that Robert’s music had truly brought his words to life. As if only musical meaning could deliver the full impact of the poetry.